Are you looking for a luxury 'grand' villa? With a lot of privacy, airconditioning, a large private pool and seaview? With a lot of space (230m2 living space) and modern kitchen and bathrooms? Then you will just love the villa Nayara! 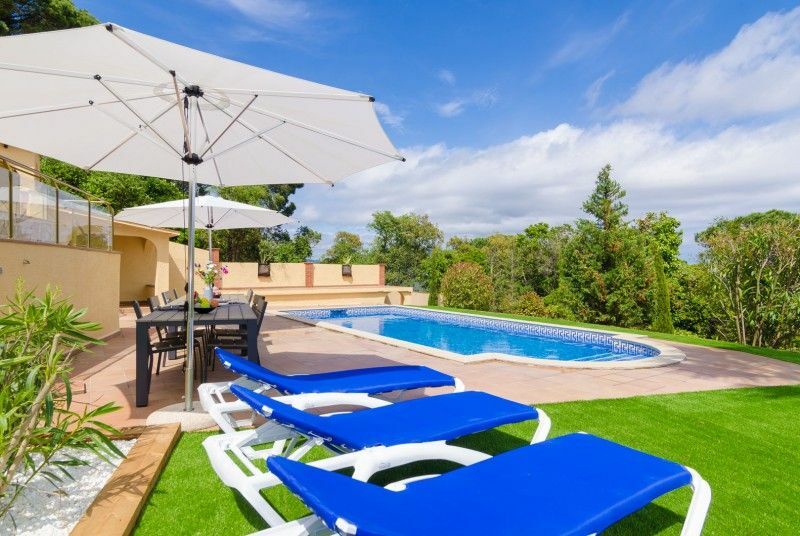 Villa Nayara is situated in the villa area Serra Brava along the road between Lloret de Mar and Tossa de Mar. At only 500m walking distance from the villa you will find the cozy restaurant El Rosell. This restaurant has a very large terrace and enormously big communal pool. There is also a free playground for the kids and a tennis court for which an admission fee is asked. The living area is large and will provide you with a view of the Mediterranean Sea. The perfect place to relax or have a small 'siesta' on the luxury sofas. A large dining table is fund in the dining area with fireplace. The new, modern kitchen is fully equiped. You'll love this part of the villa. I'm sure some amazing cooking will be done here. The 48 inch Samsung TV has channels in several languages and disposes over connections for HDMI and USB. The home cinema set can be used to play CDs, DVDs and Blue ray dics. Of course the villa Nayara has a WiFi internet connection. All 3 bathrooms are fully equipped with bath with hydromassage. One of those is situated on the top floor and 2 on the lower floor. The last bedroom can only be accessed through another bedroom. It has it's own door. The outside area is just lovely, with a lot of privacy. Relaxing and enjoying your vacation on the large terraces poolside (4x8m pool) and balconies. The villa has exterior lighting and very cozy multiple color pool light. Near the barbecue you will find the large 12 person outside dining table. There is also a second fridge for cool drinks near the pool. The neighbouring plots on both sides of the villa are not build upon: perfect for your privacy. The private garden has a large lawn: Ideal for the kids to play on or relax on your sunbed under the palmtree. U will certainly feel right at home at the villa Nayara! Goed verzorgde schone villa van een hoog kwaliteits niveau. Veel luxe, Bedden en meubilair van een zeer goede kwaliteit. De BBQ bij het zwembad is super. Prima ontvangst en alle moeite werd gedaan om ons verblijf zo aangenaam mogelijk te laten verlopen. We stayed here with 8 people and had a great time. Villa was equipped with everything that you need. Service by Club Villamar was perfect.